When renovating a house, you may find that it already has an old flue. In most cases, this will be a smoke system connected to an old open firebox, which might be concealed due to structural changes or might still be visible but no longer working. Let's see what needs to be done and the various options available for those of you who want to reuse an existing firebox. First of all, you will need to contact a qualified chimney technician to check that the flue is actually working and, if a new system should be installed, that smoke can be discharged effectively. The old flue will have to be checked all the way up to the chimneypot and cleaned out thoroughly to make sure there is no clogging or creosote encrustation. Creosote is a highly flammable and dangerous material produced by condensed fumes during the combustion process. Once the necessary technical inspection and cleaning is done, if you are thinking of reusing the existing flue your first option will be to install a stove. In this case, a stove with upper smoke outlet is the ideal solution. These models have a smoke outlet on the top, unlike most stoves, which generally have it on the back. As a result, connecting them directly to the existing flue system is a fairly easy task. 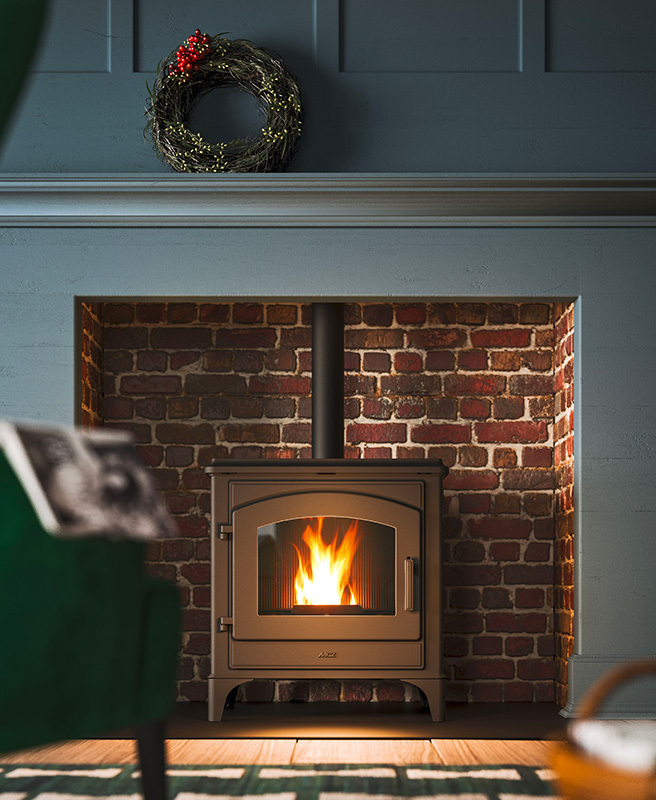 In the case of an old open firebox, you will find that a low stoves with a height of about 80-90 centimetres would be highly practical, since it can be inserted directly into the existing compartment, giving it a “British” touch. Upper smoke outlet models come in wood-burning and pellet versions. Pellet stoves are, without a doubt, more practical to use but also to install. In fact, the flue used for pellet products is actually much smaller than the one used for wood-burning products (10 cm in diameter vs. 25-30 cm in the case of wood), which means that it will be much easier to insert it into the existing flue system. 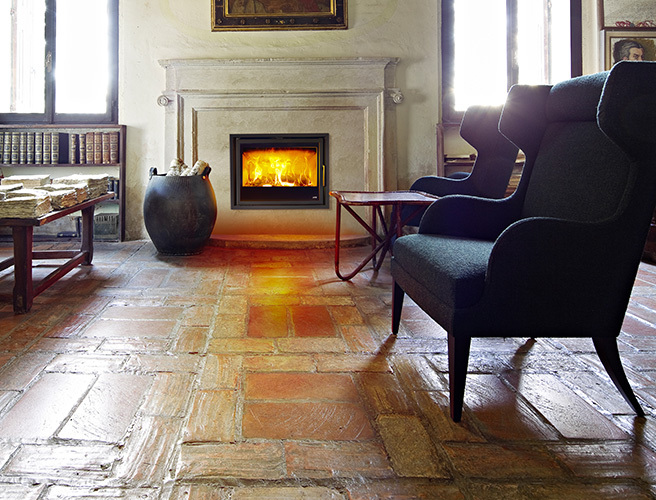 If you want to reuse an existing flue but also maintain the look of a real fireplace, you may want to consider an interesting option: fireplace inserts, available in both wood-burning and pellet versions. An insert is basically a very compact monoblock, which can be directly inserted into the existing firebox without major masonry work. All it takes is connecting the insert to the existing flue, dabbing the side areas with fireproof plasterboard, and the job is done.